As usual a fine product. Very heavy material, the buckles seem a bit light duty but should be OK. I am 6'5" and 260# and it is plenty big enough even with winter clothing under. I'm not expert but as far as I can see it is true to the originals. Well made of strong materials. Generous fit to cover tack as well as rider. Another great one. Thanks Jerry! This item is outstanding. I can not wait to use it while riding. Some of my equestrian friends who do not reenact are considering picking one up just for riding. Sturdy construction as well as a good copy of the originals. I am most pleased! 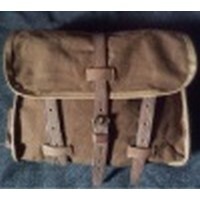 This is a great repro of a much needed item for mounted troops. Of course, it was also issued to dismounted troops in early 1918 up to mid Summer when the dismounted raincoats became general issue. I have just worn this in the field, and it performed awesomely. My only complaint would be that the fasteners don't seem very heavy and lack the reinforcing behind the rivets. I fear that that may be a possible point of future failure. Still, a great product.